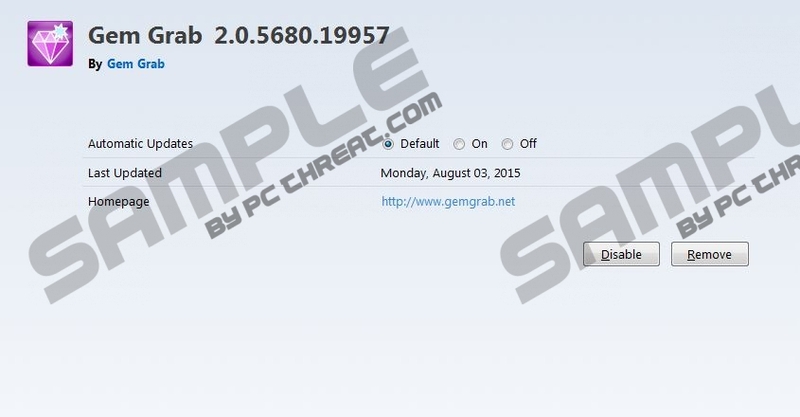 Gem Grab is yet another adware application that is built on the Injekt engine. This adware is no news to our researchers, who say that it is identical to Sale Charger, Assist Point, Positive Finds, and many more. Gem Grab is also very similar to the SuperWeb family of ad-supported applications. On the whole, most adware programs are the same. Their only purpose is to generate revenue for their developers based on the pay-per-click system. The more ads you click on, the more traffic they redirect to third-party websites. The only problem is that it is not without danger: You can easily end up on unsafe websites. But this is not all. While for a lot of users adware ads seem like innocent commercials, they hold potential threats to your privacy and system security. If you do not remove Gem Grab, you might even put your system in jeopardy of being scammed by criminals. Although this useless application has an official but very plain website, gemgrab.net, it is unavailable for download there. This is a rather suspicious trait and general characteristic of adware, because these applications mostly spread over the net in free software bundles. Since it is possible that more than one infection is packed alongside a legitimate free program, you can imagine what happens if you install such a bundle. Obviously, you will have multiple security issues simultaneously, and not all of them may be as conspicuous as adware. You may not even realize it, but silently in the background criminals might gain access to your computer, your hard drive, your files, and your data. Deleting Gem Grab is only one step towards security. In order to be certain that your PC is free of infections, we suggest a full system scan as well. Gem Grab is the usual deal, nothing more, nothing less. This adware presents you with third-party banner ads, pop-up ads, and shopping offers. These ads can seriously destroy your general browsing experience. At the same time, these third-party advertisements might also lead to malicious websites. Nobody can guarantee the reliability of the contents you might be exposed to. You might also start seeing relevant ads, too, which are more likely to entice you into clicking. You need to know that those tailored ads are the result of analysis of data collected about you executed by this adware. The only reason for these targeted ads is to make sure you click. Keeping Gem Grab on your system is a bit like taking a stroll on a field of landmines. If you want to protect your system and your files, you should not think twice about removing it. We have kept the best part for the end: It is very simple to get rid of Gem Grab. Even if you go for the manual removal option, you can accomplish it within a minute. If you need a crutch, you can use our instructions below. Since this adware is quite likely not the only “uninvited guest” on your computer, it is advisable to run a full system scan to detect the presence of other infections. If the scan finds any issue, you should not hesitate to install a professional antimalware program in order to fix those and protect your computer from further infections. Press Win+R and enter Control Panel in the box. Click OK.
Quick & tested solution for Gem Grab removal.